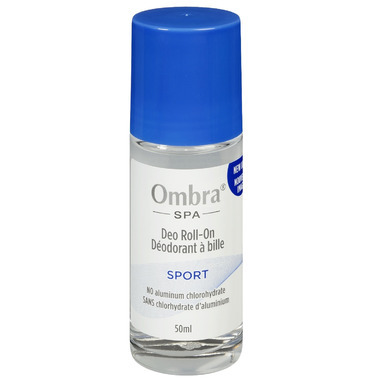 The Sport Deo Roll-On is the sportier version of our mild deodorant for those who desire a stronger scent. It contains Farnesol and has a skin neutral pH value of 5.5. Found this stuff the other day ... wish I knew about it years ago. I absolutely love it . I was using old spice and I hated it because its has aluminum , and I tend to like men's scent deodorant as someone who can smell . So i highly reccomend and enjoy this stuff. The sport has a very nice scent, lasts almost all day. There are some days I have to reapply in the evening if I'm going out. I've tried a lot of natural products that have irritated my skin by this one has been the best. I come back to this one again and again. Very pleasant smell, last almost all day without restricting natural perspiration and does not irritate the skin. All of us in the family use it. The glass jar is so much more environmentally friendly to dispose of than plastic. We also try to avoid plastic containers because they often leach into the content, so this is a really great product! This is my husbands favorite deodorant. Hard to find in our area so am very happy to be able to get it here. Please never discontinue this item. This deodorant is a hit with my husband and now my son. It doesn't smell too strong and lasts almost all day. My husband had sensitive skin and this is the only deodorant that does not irritate his skin. We highly recommend it! Preferred deodorant in our family. Glass jar can be recycled, which is more environmentally friendly than most other deodorants. We use the sports version, nice smell, good coverage of odor and long lasting. Definitely comes highly recommended! I am really happy with this deodorant! I have tried so many natural deodorants and its hard to find one that keeps smelling nice and works well too! It does smell strong at first, I got used to it and its fine now, I would rather smell something kinda nice than something else!! This one does not leave residue on clothes, never have a problem with B.O. I'm glad I found this deodorant! Will continue to buy. absolutely love this deo - no aluminum content, no plastic bottle - the deo works really well, my husband won't use any other (he is also allergic to quite a few of the mainstream deos for men and usually ends up with a bad rash) and it is strong enough to keep the upper hand during his workouts. I love Ombra Sport. Iit keeps me dry and contain no aluminum chlorohydrate - as does so many other deodorants. And it's reasonably priced ( of course shipping/handling to the US more than doubles the price ). I can't find it in the US. First time to try it and like it; recommend to others. I always buy this product for my husband as he has sensitive skin and cannot use regular deodorant. This product smells good and actually works!! An excellent deodorant which lasts for several hours and does'nt irritate the skin. Nice product, nice sporty smell and good price. I like to change but always come back to this one. Great product, works as well as I'd expected. No irritation, super mild.